The owners of a Lynnfield asbestos removal company have pleaded guilty to a number of Massachusetts Clean Air Act and Solid Waste Act violations, as well as evasion of unemployment insurance and filing false statements with the Environmental Department of Protection. Our Boston mesothelioma lawyers understand that even given all that, only one will serve 30 days in jail, followed by three years of probation, while the other will serve only the three years of probation, without the jail time. During the course of their probation, they will not be allowed to work in the business of environmental remediation. In other words, they won’t be in charge of asbestos clean-up anytime soon. We hope they’ll find another permanent occupation. Still, it seems a light sentence for a pair that put so many people at risk, though we realize that enforcing the act at all is a good step, given the fact that so many violators have apparently gotten off scot-free. This case began to come to light back in September 2010. That’s when the Massachusetts Environmental Strike Force (overseen by the state attorney general and the state DEP) were tipped off that owners of AEI Environmental were reportedly illegally storing garbage bags of asbestos at a local self-storage facility. Investigators looking into the complaint found hundreds of bags of asbestos stuffed into a storage unit at the facility – all of it from work that the company had performed. Apparently, the company had used the storage facility to essentially dump asbestos they had removed from properties in Marblehead, Beverly and Lynn, including schools and other public buildings. Additionally, they did not notify the DEP that they would be doing the removal work or that they were storing the fatal compound at the site. As you are probably aware, asbestos is the primary source of mesothelioma cancer, which is terminal. However, area residents may not know for decades whether they have been exposed to the material, as the disease lays dormant for decades. 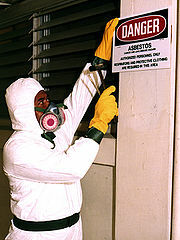 Because it’s so deadly, particularly when its airborne, asbestos has to be removed according to very strict parameters. Those include the requirement that the removal contractor be licensed and that the company notify the DEP when removal is taking place. In this case, the two were convicted of not being licensed and of convincing other contracting companies to file the notice – indicating that they would be the responsible party. Of course, this last piece seems to indicate major problems with the entire asbestos abatement system. The fact that the owners of this company were also found in violation of labor laws by failing to have unemployment insurance for its workers is no surprise: They didn’t appear to keep anyone else’s welfare in mind except their own.